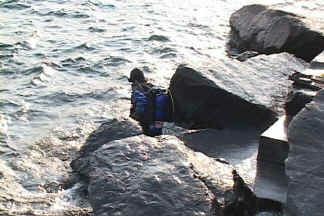 After five years of patiently working with and prodding the Minnesota DNR the Hesper break wall access became a reality in September 2003. 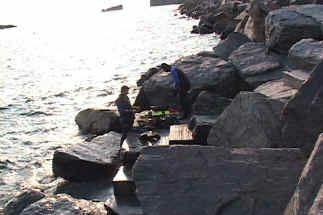 Divers can now drive out on the break wall at the Silver Bay Marina, drop off their gear at the turnaround, then move their car to the parking lot while they are diving. 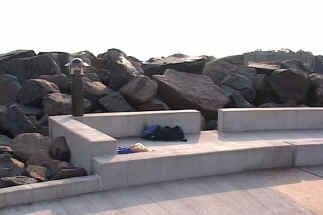 There are concrete benches to use to suit up and some simple concrete steps down the rock break wall to the water. 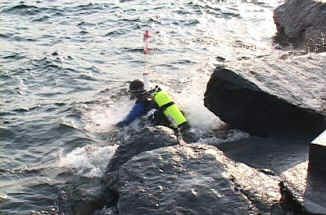 At water level there is a larger staging area to do your final suiting-up or for removing your gear after the dive. 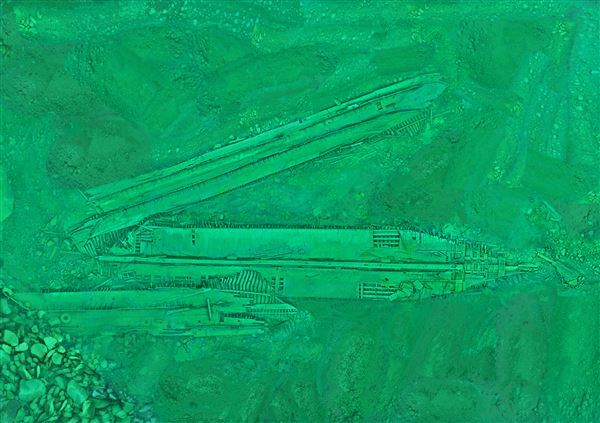 The steps are inconspicuous and do not ruin the esthetics of the marina or break wall. ( I didn't know break walls had esthetics.) The access puts you about 75 feet from the wreck which now makes the Hesper the most accessible wreck on the North Shore. GLSPS was the driving force that worked with Trails and Waterways divisions of DNR to plan the break-wall access to the Hesper and with the DNR project engineers to see the project through. We are pleased with the results of our cooperation with the MnDNR. If there is one thing we have learned in working with government agencies, is that patience and persistence pays off which is why these access projects are ongoing. Our many thanks to the folks we worked with in the DNR. Also stop by the Hesper display in the Silver Bay Marina building! 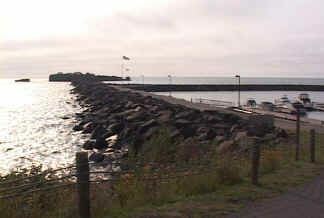 The access is located at the turnaround at the end of the break wall in the marina in Silver Bay, MN. A sign marks the entry on the break wall drive side. The marina side of the path is just rock. Concrete benches can be used for collecting and staging your gear. 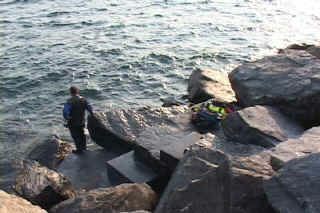 Simple concrete steps make the trek down the break wall to the lake relatively easy. A larger staging area is at the bottom of the steps. Entry between the rocks can be a little rough, but typically reasonable. Beware that ease of access varies dramatically based upon water conditions and water levels. 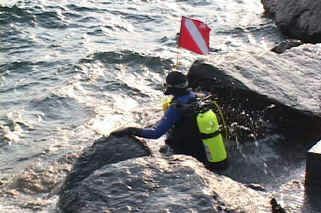 Don't forget your dive flag. It works even in some rough water, but don't forget you also have to make your exit in the rough water! 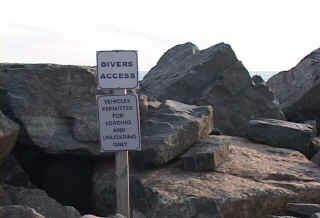 Time your entry/exit with the waves and be extra cautious - the rocks are NOT forgiving.